Chimchar in game: 8,292 Who? Important notice! Pokemon Chimchar is a fictional character of humans. All Pokemon are made up by humans based on real animals or existing objects. The stroies of Pokemon are all fictional and in most cases illogical or nonsense. Chimchar (Japanese: ???? Hikozaru) is a Fire-type Pokémon introduced in Generation IV. It evolves into Monferno starting at level 14, which evolves into Infernape starting at level 36. Along with Turtwig and Piplup, Chimchar is one of three starter Pokémon of Sinnoh available at the beginning of Pokémon Diamond, Pearl, and Platinum. Chimchar is a bipedal Pokémon resembling a chimpanzee. Its fur is primarily a shade of orange, though its face, outer ears, underbelly, hands, and feet are light yellow. Its rear has a small, round, red patch that is usually obscured by flames produced by burning gas in its stomach. These flames go out when it goes to sleep, and burn weakly when it feels ill. Its ears are large in comparison to its head size and red inside. It has two pointed teeth in its upper jaw. Chimchar has red markings nearly surrounding its eyes, a swirl-like symbol on its chest, and five fingers on its hands with three toes on its feet. It has a swirly crest of hair on its head. Being very agile, it is able to climb the rocky ledges of tall mountains, where it lives. When Paul first appeared, he commanded a Chimchar in When Pokémon Worlds Collide!. Paul released it in Glory Blaze, allowing Ash to catch it in Smells Like Team Spirit. It evolved into Monferno in Evolving Strategies! and later into Infernape in Fighting Ire with Fire!. 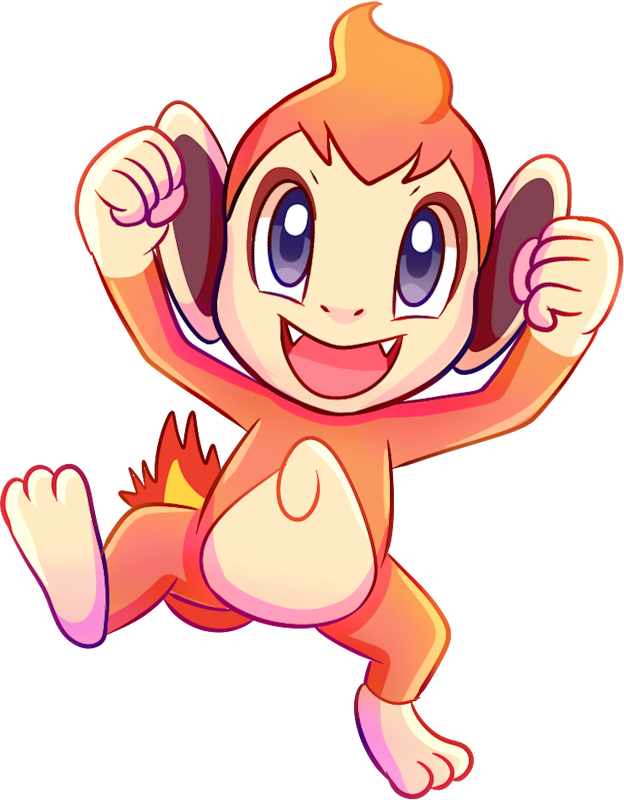 Flint received his Infernape as a Chimchar, as seen in Flint Sparks the Fire!. Chimchar is also one of the two main members of Team Poképals which appeared in Pokémon Mystery Dungeon: Explorers of Time & Darkness and Pokémon Mystery Dungeon: Explorers of Sky - Beyond Time & Darkness. Chimchar first appeared in Following A Maiden's Voyage!. The little fire-monkey was teasing a Piplup after stealing food from it. Piplup then started firing a Bubble Beam attack, but Chimchar kept jumping out of the way. Staraptor was hit in Piplup's line of fire and composed a Whirlwind that wrecked everything in Professor Rowan's lab. Chimchar jumped out of a broken window with Piplup chasing after it. 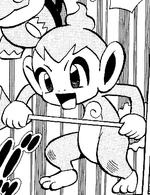 A Chimchar owned by Rowan also appears in SS024. Alice from The Rise of Darkrai owns a Chimchar. She uses it to power her hot air balloon with Flamethrower. It later appeared in the ending credits of Arceus and the Jewel of Life. A Chimchar appeared in Pikachu and the Pokémon Music Squad. In Dawn of a New Era!, a Trainer at the Pokémon Center had a Chimchar. A Chimchar also appeared in Classroom Training!. It was battling a Turtwig at the Trainers' School. One also appeared in Meloetta's Moonlight Serenade. A Chimchar appeared as a plush toy in A Jolting Switcheroo!. DP003 Chimchar Ash's Pokédex Chimchar, the Monkey Pokémon. Chimchar easily climbs the sheerest of walls and lives on mountain tops. When it sleeps, its flames go out. A Chimchar ended up in Pearl's possession due to a mix-up. While in Eterna City, Chimchar evolved into Monferno, and became an Infernape with Tru after its usage in the Veilstone Gym challenge against Maylene. 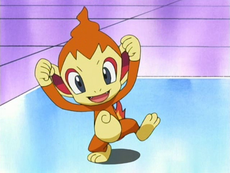 Chimchar was Mitsumi's starter Pokémon. While it appears as an Infernape throughout the story, it was seen as a Chimchar in a flashback in Battle Against Team Galactic...and Mitsumi!. In the Pokémon Mystery Dungeon: Blazing Exploration Team manga, an adaptation of Pokémon Mystery Dungeon: Explorers of Time and Explorers of Darkness, main character Totodile teams up with a Chimchar named Hono, who was once a human, to form Team Blaze. Yu Shirogane has a Chimchar which evolved into a Monferno and then into an Infernape due to the training he went through. 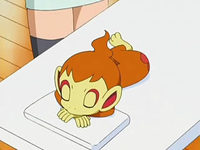 Chimchar appeared in PMDP04 under the ownership of Kazuki. Pokémon Adventures PS339 Able to climb nimbly up ledges and cliffs. They live on top of rocks and extinguish their flames when they sleep. One Chimchar figure has been released. Chimchar is a trophy in Super Smash Bros. Brawl. "A Chimp Pokémon. 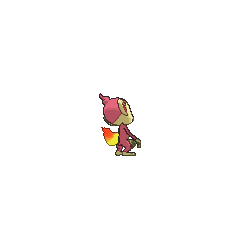 With a flaming tail, Chimchar is skilled in Fire-type moves. Its light body affords it the ability to scale steep cliffs and live atop rocky mountains. Some say that the fiery tail is fueled by gas made in its stomach. Not even rain can put out the flames, but Chimchar always puts out the fire when asleep. Chimchar evolves into Monferno." It agilely scales sheer cliffs to live atop craggy mountains. Its fire is put out when it sleeps. Its fiery rear end is fueled by gas made in its belly. Even rain can't extinguish the fire. It is very agile. Before going to sleep, it extinguishes the flame on its tail to prevent fires. Magical Lake: Dual Launchers, Variety Battle: Get 1,000 Combos! Moves marked with a superscript game abbreviation can only be bred onto Chimchar in that game. It spits embers to attack. It attacks by spitting fire. Chimchar came to the PokéPark to become stronger. He's got what it takes to play Venusaur's Vine Swing and Bastiodon's Block Barrage. He likes some other Attractions, too. Occasionally changes when a foe will next disrupt your play. 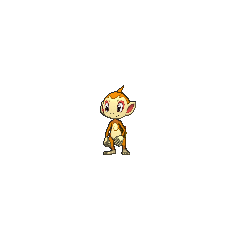 For other sprites and images, please see Chimchar images on the Bulbagarden Archives. Chimchar is the only starter Pokémon that is a member of the Human-Like Egg Group. 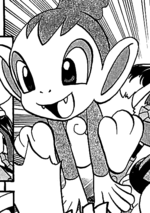 Chimchar appears to be based on a young chimpanzee. However, the markings on its rear without the flame, (plus facial markings on its evolutions) seem to indicate that it is more a cross between a chimpanzee and a young baboon. 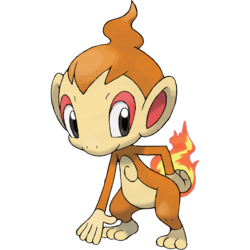 Chimchar is a combination of chimp and charcoal or char (to burn). Hikozaru is a combination of ? hi (fire), ? ko (child), and ? saru (monkey). Zaru is also used to describe an ape. Mandarin Chinese ???? Xiaohuoyànhóu Literally "Little flame monkey"
Pokémon and respective character names/images are trademarks and copyrights of their respective owners. We are not affiliated with Nintendo, The Pokémon Company Creatures Inc. or Game Freak.